Our ordinary mind always tries to persuade us that we are nothing but acorns and that our greatest happiness will be to become bigger, fatter, shinier acorns: but that is of interest to only pigs. Our faith gives us knowledge of something better: that we can become oak trees. I sometimes get caught up in my own little world and forget that there is something, someone more I can be if I just let free this awful thought in my brain that I will only be who I am now. If I can uncage this thought it can morph into its truth, that I will always be who I am now. Only keeps the cage locked, trapping me inside this little acorn, trying to bust out of what will always be this tiny little acorn, no matter how much bigger or fatter or shinier I become. 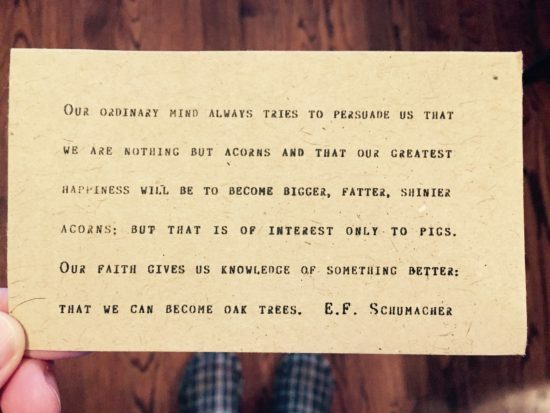 If I hold fast to this belief that I am only and I will only be this acorn I am now, then this becomes my truth. I will only be who I am now. But always, always is freeing. It allows for depth and expansion and wisdom that will always have come from that tiny little acorn, and is now allowed to grow into her own oak tree. Always being the acorn I am now means there is room for this acorn and all the expansion that will come from its growth. With always there is now room for depth of roots and expansion of branches and perhaps housing or recreation for squirrels (or pigs, if you don’t live in the city). I will always be who I am now, and also whoever grows from here. With that, I find much happiness. What about you? © 2017, Authentic Realities. All rights reserved. Previous post: First impressions don’t always stay true, and then what?